Looking after our customers in a Leaf driving to London ! Last week we had a couple from London fly up to Orkney to collect their 2nd hand 30kwh Nissan Leaf. They wanted an adventure and after the flight being canceled in Aberdeen to Orkney , they finally arrived on a cold Thursday evening at Kirkwall airport, yes the adventure had started with the airline called ‘Fly Maybe’ ! After an overnight B & B we met again on the Friday to spend time showing them both how to rapid charge an EV and also all the post codes for their return journey to London from Aberdeen docks. They caught the overnight Northlink ferry from Kirkwall to Aberdeen on the Friday night and arrived at 7am Saturday. There first stop was Forfar to top up the Leafs charge, and onward south they went. Below is the message we received upon their return home ! We wanted to let you know that we made it! Not that we had any doubts of course – the car ran like a dream the whole way. We made it as far as Kendal last night and managed a short side trip to check out Lake Windermere this morning. This involved driving through a ford on a tiny rural road. Even though it was only a foot deep, the idea of electricity and water made us slightly anxious, but fortunately no sparks flew! We only had one moment of range anxiety, having driven a little too fast through the hills of south Scotland, leaving us 4% when we got to the next chargepoint. Otherwise we learnt a lot about how to drive for the maximum range, and it was strangely relaxing not trying to rush everywhere… I think we’ve also figured out all of the buttons and screens too. All the best – and hopefully we’ll find another excuse for an Orkney trip sometime! 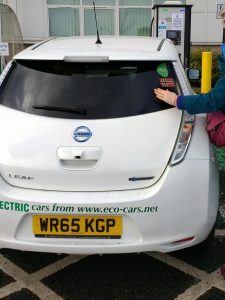 We love helping folks to see that even for newcomers to electric vehicles, we’re on hand to help you drive 100’s of miles with ease on your first ev adventure ! See our testimonial web page for more comments from these and other customers of ours !